This biometric safe is similar to Protex's HZ-34 model, but is larger. It uses a person's fingerprint to open the safe, rather than a key or combination lock, and is a great option for any business having a small number of employees or regular customers. Up to 30 fingerprints can be stored electronically. 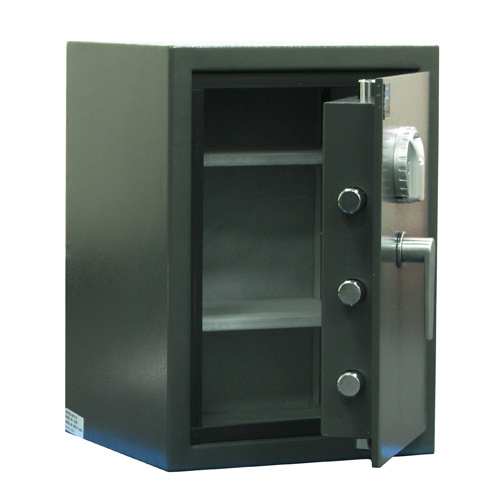 Also makes a great safe for renters or to place in a boat or RV. Heavy enough to deter burglars (and can be drill-mounted into the floor), yet still capable of being packed in a household move (right alongside your washer, dryer, and other appliances). Two adjustable and removable shelves allow flexible sizing of the internal compartment. And this safe is rated at 30 minutes fire protection, too.